If you join the 76% of our nation in following Sunday’s Super Bowl broadcast, you’ll hear a lot about the competing quarterbacks–their ages, character, decision-making, legacies, and so on. The matchup is tantalizing. Young, budding superstar Russell Wilson will lead Seattle against the Patriots’ Übermensch, Tom Brady. By the end of the game, you may catch such hyperbole as “immortal” or “officially elite,” depending on how the result swings. Aside from Marshawn Lynch’s antics or the squaring-off two of the 21st century’s greatest football coaches, Pete Carroll and Bill Belichick, the quarterback duel is the biggest story heading into Super Bowl XLIX . But before all the hoopla and fanfare—before the fireworks or overly dramatic national anthem, before your uninvited Super Bowl party guest spills his beer on you, and before Katy Perry (and, somehow, Lenny Kravitz) performs– it’s important to visit the data for some perspective. 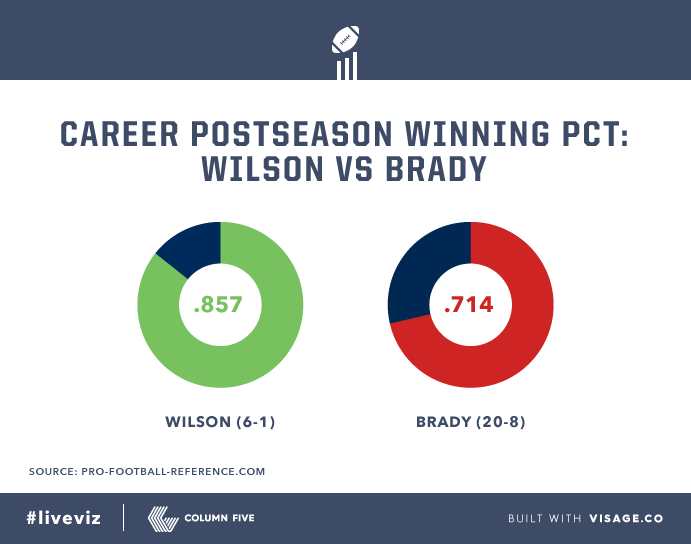 Let’s break down the numbers between Russell Wilson and Tom Brady to see what story they tell. Russell Wilson has been magically efficient in the playoffs and was extraordinary in last year’s Super Bowl dismantling of the Denver Broncos. For the uninitiated, QB rating is a metric (maximum 158.3) calculated from a combination of a quarterback’s passing attempts, completions, yards, touchdowns, and interceptions. (For some context, Aaron Rodgers holds both the single-season and career records of 122.5 and 105.2, respectively.) 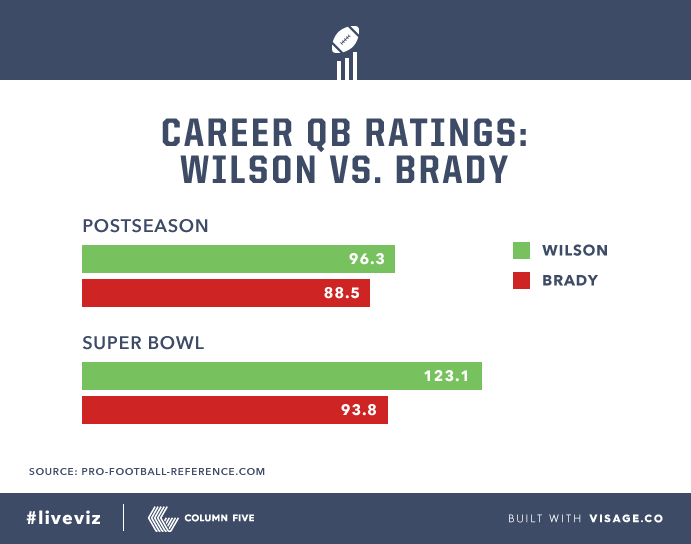 So our first chart suggests Wilson holds a strong edge over Brady in their careers’ biggest games. 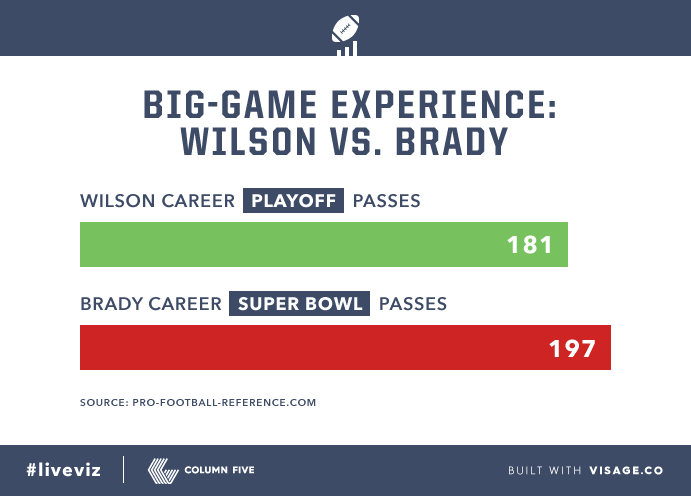 And Wilson’s prowess has already led to great NFL success. The beginning of Brady’s career was even more remarkable. Tom Brady started his career a perfect 10-0 in the playoffs. After replacing injured veteran Drew Bledsoe early in the 2001 season, Brady soared from unknown backup straight into Patriots lore, bringing home 3 Super Bowl championships in his first 4 seasons. 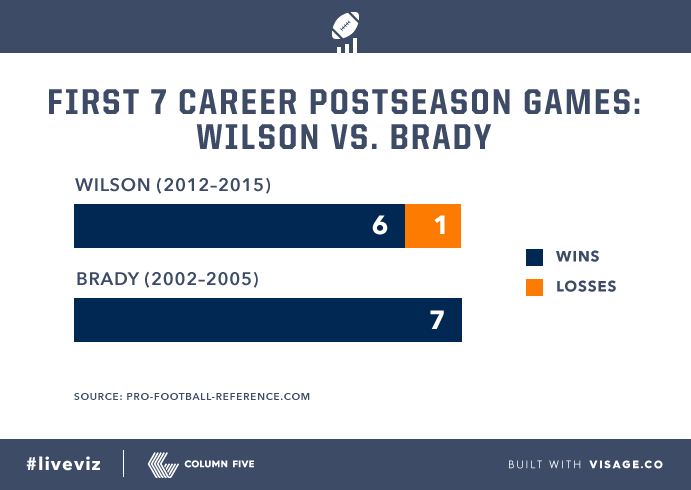 Although he hasn’t won a Super Bowl since 2005, Brady has consistently remained one of the league’s strongest QBs. Which leads us to perhaps the most telling single graph about the matchup. Most quarterbacks consider themselves lucky to compete in one Super Bowl. This will be Brady’s sixth, which has resulted in some handsome contracts for Brady. The discrepancy between the two quarterbacks’ pay grades is striking. 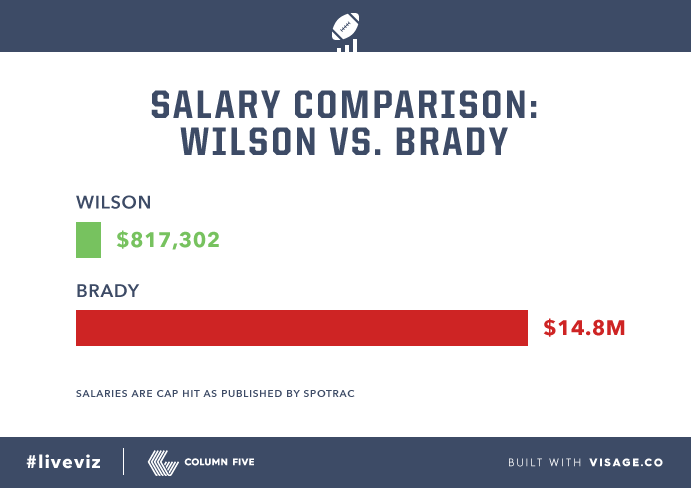 Brady is compensated more than 18 times Wilson’s salary–especially impressive when you consider he’s restructured his contract repeatedly to allow the Patriots to bring in more high-end talent. Wilson, meanwhile, is finishing out his NFL rookie contract, which is suppressed by the league in order to protect teams from falling into bad contracts. Don’t feel too bad for him, though: He’s expected to become the NFL’s highest-paid quarterback this offseason. All of the on-field performance data suggest a great matchup this coming Sunday. Often, Super Bowl performances can be defining moments in quarterbacks’ careers. Jon Elway was the goat of Denver until he won in his fourth try; Trent Dilfer was no great talent, but he’ll always have a special place in Raiders fans’ hearts for his 1990 championship. The fate of Super Bowl competitors can mean the difference between lifelong glory and irrelevance. 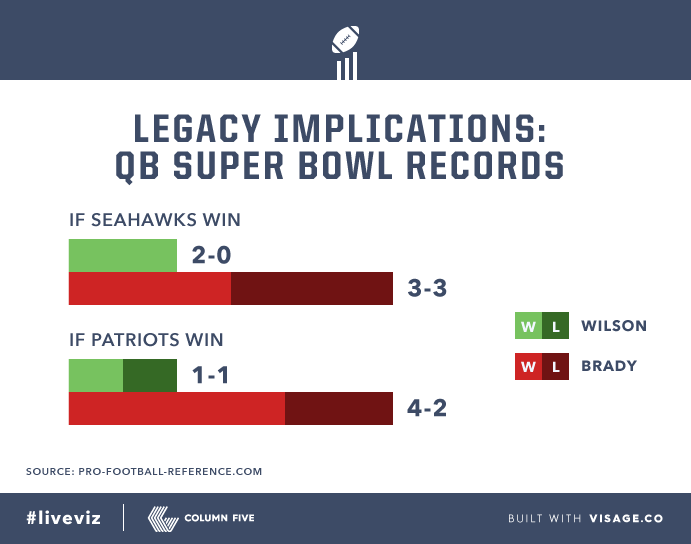 Both Wilson (1-0 in the Super Bowl) and Brady (3-2) have already won at least a title, so they won’t be soon forgotten, but Sunday’s Super Bowl XLIX result certainly will leave a mark on their résumés. Here’s what’s at stake for each quarterback’s legacy. Brady has a bit more to lose, reputation-wise. A loss on Sunday will make three Super Bowl losses in his last three attempts (in addition to 2007; 2011). Now you’re equipped with enough facts and stats to one-up even the truest NFL fan at your party Sunday. So who will be the best quarterback this Super Bowl: young reigning champion Russell Wilson or dreamboat veteran Tom Brady? It’s anyone’s pick. Let’s throw it to Vegas odds makers for the final word. Column Five will be producing live visualizations to accompany Sunday’s Super Bowl XLIX experience. 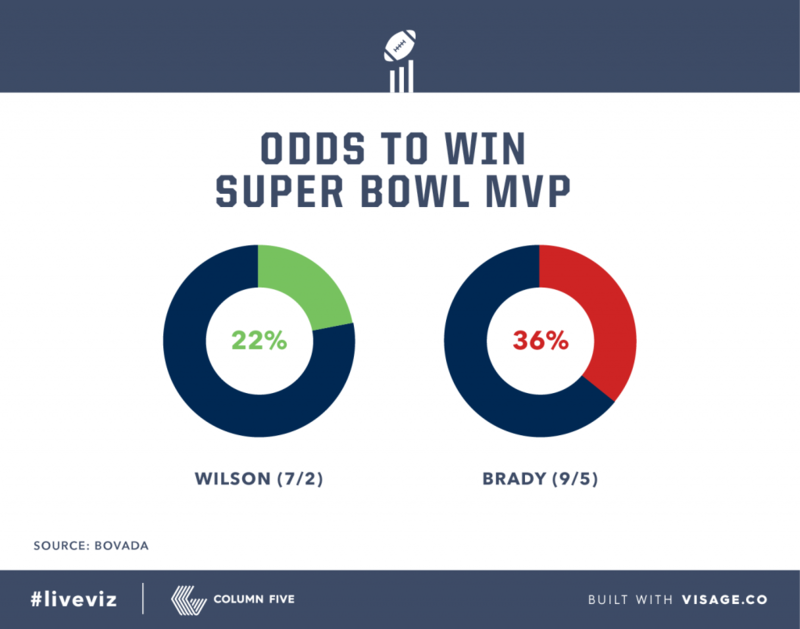 Follow Column Five and Visage on Twitter, and keep up with the #liveviz hashtag to see the game’s best stories visualized in real-time.